What is the temperature in our refrigerators? 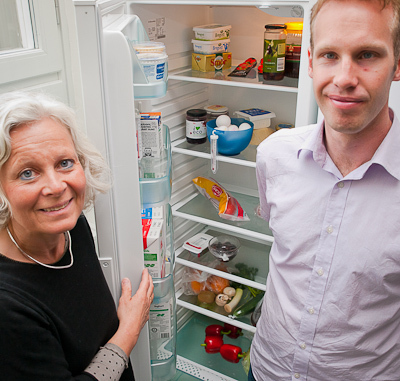 SLU PhD student Mattias Eriksson and Ingela Marklinder from the Institute of Food Science at Uppsala University investigate. Visitors are invited to participate in mass experiments/studies. By having a large number of people participating in numerous experiments, researchers gain access to a large amount of data that they can then analyse. The conclusions are subsequently presented in a scientific report. Mass experiments have been organised for schoolchildren in conjunction with Researchers’ Night. They have included studying carbon dioxide levels and the acoustics in Swedish classrooms, as well as the temperature in the refrigerator at home. In Norway a mass experiment where schoolchildren dug for worms led to the discovery of earthworms in areas where worms were previously unknown. Target group: Flexible, often schoolchildren. Preparations: Find a suitable mass experiment that can be implemented on a large scale. Market the activity. Challenges: Finding a suitable theme and researchers who want to use the data gathered. Efficiently gathering and compiling date. Benefits: May provide relevant research results. With the right theme you can attract a lot of people through a single activity. Gives the public an insight into how research works. Informs the participants about scientific methods and allows them to feel that they are participating in research. Often picked up by the media.